Directly from Donna Dewberry, the creator of the ONE Stroke process, these delightful books offer lots of project ideas. 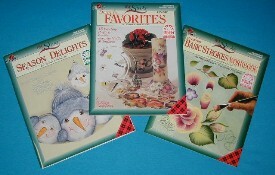 They take designs and techniques from the ONE Stroke Reusable Teaching Guides and OneStroke.Net Basic Beginner Kit and turn the patterns into projects you can complete! Scroll down or Page down to see the books. are priced 1 dollar below retail.